Beyond the Sling is broken into three parts (which are then further subdivided): What Baby Needs, What Baby Doesn't Need, and What Mama Needs. Bialik has a PhD in neuro-biology, and so she comes off as informed, but her focus is not so much the science as it is the sense of what feels right for your family and best for your baby. The core principles of AP are discussed: natural child birth, breast feeding, co-sleeping, baby wearing, cloth or no diapering, gentle discipline, etc. While she constantly reminds her reader that she understands the individuality of these decisions, pressure still bleeds through the prose a little bit. There was a lot of "I understand not everyone can or will make these choices, it was simply what was right for me because...I love my babies and want the best for them and this is the best." Which can start to sound like "not everyone will make these decisions because they don't love their babies as much so they'll choose adequate secondary options." That being said, I did not resent her at the end of the book and truly believe that she understands the decision making process and respects other mothers whether they practice AP or not. While it was easy for me to immediately decide that elimination communication (diaper-less babies roaming free) was not for me, other parts of AP aligned with my beliefs, and I was inspired to find ways in which I could incorporate them into my own choices. It opened up a dialogue with my own set of perceived parenting ideas (and amazing discussions with my husband) as I had to consider why what she was describing was not something I would choose to do. In the end, breast feeding (if I am able), gentle discipline, and some form of baby wearing are the three things I’ll definitely incorporate into my life, but I honestly feel that Mayim would be okay with that. My favourite take away from this book is the idea of logical consequences for actions. 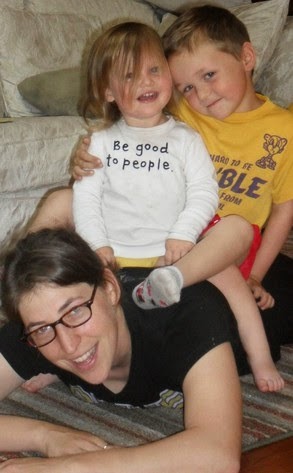 As a part of gentle discipline, Mayim described the oddness of threatening children with seemingly unrelated punishments for actions, ie: "If you don't stop screaming, we won't go to the park later!" What does screaming and the park have to do with each other? Instead, she recommends using language to describe the connection between behaviour and response, such as "The way you keep screaming makes me afraid you won't listen to me when we go to the park later and it's important that you listen to stay safe when we go out." Ah! There's the connection. While reading parenting books, blogs, and websites that validate your choices can be comforting and offer much needed advice and troubleshooting when most needed, I think it behooves us to read widely about experiences different to our own as well. If nothing else, it gives us pause to reflect on the decisions we make and allows us the time to appreciate the good job we are doing as mothers and fathers. I would recommend this book to those unfamiliar with attachment parenting for just that reason.